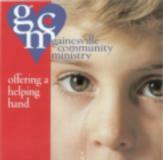 Gainesville Community Ministry is a faith-based organization providing food, housing, transportation, medical and other assistance to the needy in Gainesville and the surrounding areas. GCM has recently opened an onsite dental clinic to provide free dental assistance to the needy. GCM is supported by donations from churches and individuals. GCM receives some support through grants and the operation of two thrift shops. Kattell and Company will perform their audit in accordance with generally accepted auditing standards and we will prepare their form 990.